Do I need an account do order online? Yes. You need to register through our online form to order online from Colan Australia. This can be done by clicking through to our registrations page. Please fill in your personal details keeping in mind fields with an astrix (*) next to them are compulsory. Our staff will confirm your registration by sending you a notification email with your username and password. If you are already a Colan customer, you may already have an online account. We have endeavoured to provide access to all our existing customers we have on our database. If you have not received a welcoming email with log in details please get in touch with our sales staff. If you have received your new log in details please log in and review your account information, updating your business information where required. If you are a new customer, please click here to go to our registrations page. Once you have registered, one of our sales staff will get it in touch with you so we can allocate you a price list. Once a price list is allocated, you will see your product prices next to each item in our online store. Online registration enables you to purchase online with Colan. 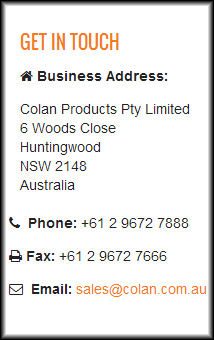 All purchases are charged prior to shipping unless the purchaser has approved trading terms with Colan Australia. Customers wishing to apply for a credit account with Colan Australia must print off our Credit Application form and fax it to (02) 96727666 back for approval. This may take time as trade references and credit checks are completed. One of our sales staff will contact you during this process to keep you informed.